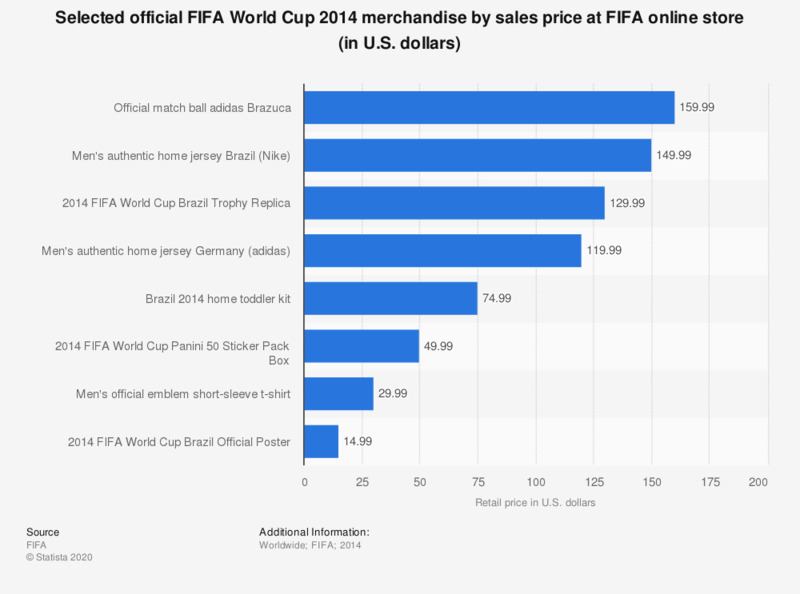 The statistic shows the retail sales prices of selected 2014 FIFA World Cup merchandise at the official FIFA online store. The official game ball - 'Brazuca' is sold at the FIFA online shop for 159.99 U.S. dollars. In a world of social media and global connectivity, the FIFA World Cup is growing in popularity with every tournament, with over 26 million Americans tuning in to watch the 2014 final. This has allowed FIFA to sell the tournament as a brand, with items ranging from replica jerseys and match balls to collectible stickers being sold on the official FIFA online store. Brazil’s iconic yellow home jersey was sold in the store for 149.99 U.S dollars and Germany’s white home jersey (in which they ultimately won the tournament) was on sale for 119.99 U.S dollars. In 2014 Adidas expects to sell more than eight million jerseys in total compared to 6.5 million in 2010. The Brazuca, the official match ball of the World Cup, was supplied by Adidas, an official partner of FIFA and official ball supplier for the world’s biggest sporting event since 1970. The name ‘Brazuca’ was selected after a public vote of over one million Brazilian football fans, with the title coming from a colloquial term used to describe pride in the Brazilian way of life. The ball is formed from six identical panels, two fewer than South Africa’s Jabulani ball, which are glued together at a certain level of heat and pressure. Whilst sales of the 2010 Jabulani ball reached 13 million, Adidas hopes to sell 14 million of the 2014 Brazuca edition. The Panini stickers available in the store have been sold during every World Cup since Mexico 1970. The products feature stadium, mascot, player, and team stickers that are intended to be applied to the corresponding album. There are also special hologram cards and the ultimate goal is to completely fill every blank space in the album. The company, based in Modena, Italy, expects to reach over 8 million fans in Brazil alone, with a record-breaking amount of stickers being sold during the tournament.